All non-Japanese nationals are required by Japanese law to carry proper identification at all times. As a resident of Japan for more than 90 days, all exchange students will be issued a "Residence Card" in the form of a photo I.D. card, and must carry this card with them at all times. All carrier of a Residence Card must register your address at the local municipal office or one of its branches within 14 days after arriving in Japan. Changes to visa status, authorized period of stay, nationality or name must be reported to the appropriate Immigration Bureau within 14 days. Bring your Residence Card, National Health Insurance Card, and My Number Card to the city office and apply for a "Change of Address" (Jusho Henko). Go to your current municipal office and submit a Notice of Change of Address (Tenshutsu Todoke) before the date of moving and receive a Change of Address Certificate (Tenshutsu Shomeisho). At that time, you must also turn in your National Health Insurance Card and My Number Card for any necessary procedures. Bring your Residence Card, National Health Insurance Card, and "My Number Card" Notice. Go to the municipal office in your new city within 14 days after moving to submit a Move-in Notification (Tennyu Todoke). At the same time, reenroll in National Health Insurance. Bring your Residence Card, "My Number Card" Notice. and Change of Address Certificate. As a foreign national in Japan, you are expected to carry your Residence Card on you at all times. If you lost your card or if it is has been stolen, you should follow the below steps within 14 days of the day on which the fact of loss/theft is known. Go to the local police station and receive a "bulletin of loss" or a "theft bulletin certificate". Head over to the police station closest to where the fact occurred or your local police station if you do not know where the fact happened. Head over to your local Immigration Bureau to apply for a new Residence Card. 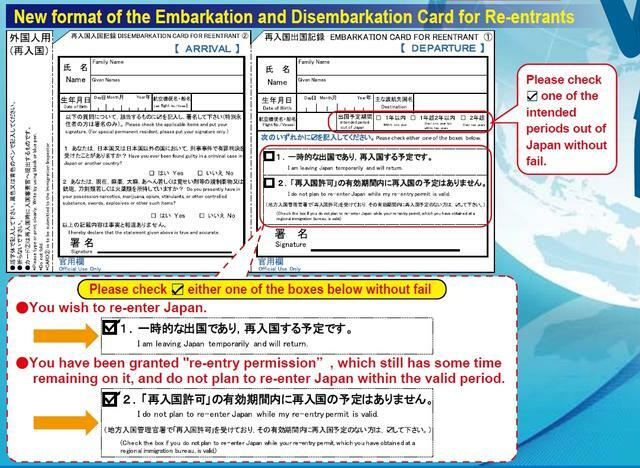 Fill out an Embarkation and Disembarkation Card for Re-entrants. Don’t forget to tick the “I am leaving Japan temporarily and will return” box. The card is available in the area directly before the immigration gate. Present your Residence Card and a filled-out Embarkation and Disembarkation Card for Re-entrants to the Immigration Officer. Failing to do so will result in your visa being voided. You must leave Japan by the moving out day. If you’d like to stay in Japan after the moving out day, please apply to change to your Residence Status to "Short-Term Stay". Failing to do so will result in you been considered an illegal immigrant, even if you have time left until the Date of Expiration on your Residence Card. If you change your Residence Status to "Short-Term Stay" to remain in Japan as a tourist, please understand that National Health Insurance will become invalid immediately after that change. You will become responsible for paying 100% of any medical bills after that time. Make sure that the validity dates of your self-purchased traveler's insurance cover your entire stay, including any tourism periods.